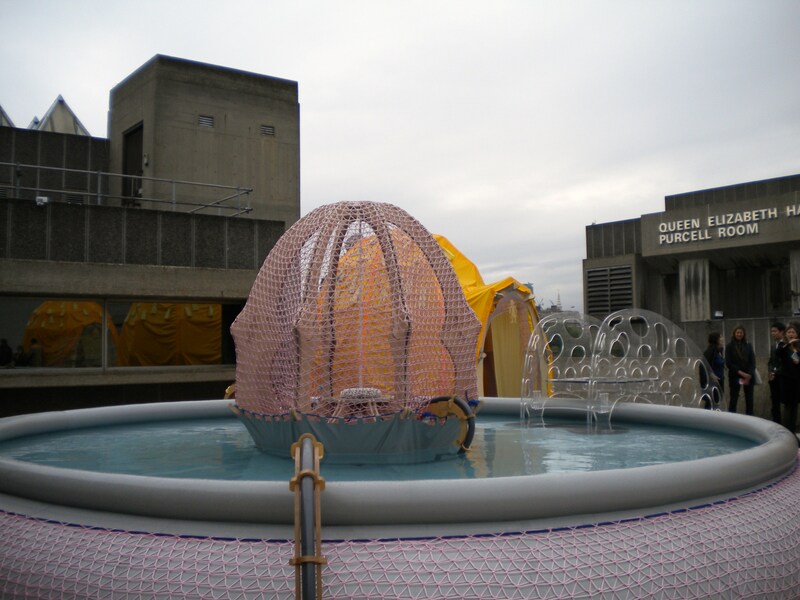 I went to see the new exhibition by Ernesto Neto at the Hayward. I’d only seen his work in photos up till now. The place to be if London ever gets any hot and sunny days will be the roof of the Hayward Gallery where Ernesto Neto has built an installation that includes a swimming pool and colourful poolside cabanas. At the opening I attended however it was brutally cold and although the water itself was warm, there was nobody brave enough (at least while I was there ) to jump in. Anyway, swimming is not why I went to see the new exhibition by Ernesto Neto at the Hayward. I’d only seen his work in photos up till now, and I found those photos odd. I could not really imagine what the work was actually like. I wanted to see it for myself. Brazilian artist Neto makes sculptures which are huge and immersive. He stretches sheer coloured material – similar to a stocking – over skeletal constructions to create tents or pavilions in which dangling sacs are filled with different materials which act as weights. The whole thing is delicately weighted and balanced yet surprisingly sturdy, able to cope with a big horde of audience going in and out of the constructions. I found it all pretty and playful, pleasant and fun. Very well crafted; splendidly so. I was principally interested in the dynamics that kept the whole thing so finely balanced, so sturdy and so ethereal. And then I found myself right in the centre of the largest structure. It resembled a mollusc, or a maze curling into itself, a flesh coloured tunnel that was translucent. As I went further and further in, I could see the gallery outside, but I couldn’t reach it; the soft, fabric structure was a real barrier. It started to feel claustrophobic, yet oddly familiar. But why? Then I started to think about the materials I was surrounded by. Stockings. Long, sheer but very enveloping stockings. And the stockings are filled with chamomile – real chamomile flowers sewn into the structure. And dried lavender. How odd I thought, all these “female” materials. Stockings. Dried flowers. As a female, I felt very much at home with them, in a way I knew that a man wouldn’t. How could Neto know? But then I thought, no, a man wouldn’t know – but a child would. The work is, among other things, a haunting evocation of the world of the very young boy, spending his days still with his mother and her mysterious world of stockings and dressing table of dried flowers and scents. Then the other objects suspended in the fabric made sense: collections of stones such as those my brother used to fill his room with. It was all just such an interesting and unusual and fresh perspective on the childhood world, resurrected from memory and transformed into a wonderland. Yes Neto’s work is about all the other things in the catalogue, but it’s also about this. And this is when I was moved, absorbed by its beauty and its truth, and truly astonished at its conception.